Digging deeper: What do exonerations teach us about the criminal justice system? Non-DNA cases: What happens if there is no DNA to test? How do wrongful convictions occur? NOTE: On February 8, 2012, the Massachusetts House voted unanimously to pass the bill allowing prisoners in the state the right to access DNA testing. Last July, the state Senate passed the bill (S. 1987). Nationwide, 280 men and women have walked out of prison after DNA tests proved them innocent of the crimes for which they were convicted. Together, they served a combined total of approximately 3,629 years incarcerated. Many of these exonerations happened because 48 of the 50 United States have laws granting inmates the right to test DNA evidence that might prove their innocence. But the famously progressive state of Massachusetts has not passed a DNA access law. The other state, the more conservative Oklahoma, passed a law, but let its implementing program expire in 2005. In Massachusetts, a new DNA access bill that would lighten the load on inmates who face a seemingly impossible procedural battle to clear their names is now before the legislature. It would create a clear process that inmates and their lawyers would follow to access not only the crime scene evidence but also the crime labs to test it. But the bill’s future is uncertain. 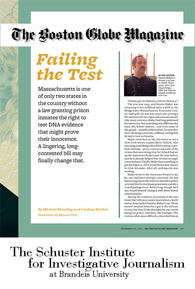 Michael Blanding and Lindsay Markel of the Schuster Institute for Investigative Journalism teamed up with the Boston Globe Magazine to investigate: Why is Massachusetts one of only two states without a DNA access bill, and what does that mean for prisoners who claim that DNA testing will help prove their innocence? Just as important, what does it mean for the citizens of Massachusetts if the real bad guys are still out there committing more crimes? For the conclusions of the Schuster-Globe investigation, read the article: “Failing the Test,” November 20, 2011, The Boston Globe Magazine. Examine the issue. This website is intended as a reading guide to "Failing the Test." It offers a more detailed look at the issue of post-conviction DNA testing in Massachusetts. © 2011-2013 Schuster Institute for Investigative Journalism at Brandeis University, Waltham, MA. All rights reserved.